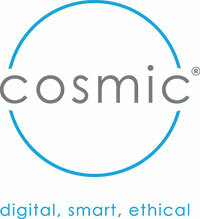 Cosmic was Social Enterprise Mark holder number one. Although that position was very closely contested by the Co-operative Group South West! In those days, I was heavily involved as Chair of RISE – the regional body supporting social enterprise developments in the South West – and therefore was also part of the team which developed and successfully launched the Mark. I also served for several years on the Board of Social Enterprise Mark CIC, working to develop its strategy for national and international developments. For all of the years since then Cosmic has continued to support and encourage the further impact which the Social Enterprise Mark can make to the wider sector and business in general. The Mark has been a fundamental part of Cosmic’s brand identity for well over a decade now, and it has proved a highly effective way to promote to the world our social impact credentials. Cosmic’s commitment to social enterprise remains as strong as ever, and the Mark acts as a regular reminder for all stakeholders – staff, Directors, partners and clients. In more recent years, Cosmic has been able to embed the Mark into all of our marketing and promotional materials. As the sector and the Mark has gained wider recognition, it has become easier to describe how we use our business model to achieve social impact, but at the same time, the Mark still represents a very useful tool for us to engage in questions and discussions about how the model works at Cosmic. Describing that our commercial services (web development, training and tech support) have the ability to generate profits, which are then 100% utilised to develop social impact projects and match-fund our work in this area with other sources of funding has become a key message for our stakeholders and clients. For example, our investment in digital apprenticeships for our own business and others, or more recently our involvement in the Enhance Social Enterprise programme, which provides digital business support for other social enterprise; both of these involved Cosmic’s own investment to achieve social impact. More broadly speaking, Cosmic operates every day in achieving social enterprise – staff, directors, partners and members all act as ambassadors to social enterprise, constantly seeking ways to achieve more social impact and share this ethos. Cosmic is very proud to have been Social Enterprise Mark holder No.1 and we very much consider ourselves as a sector leader and ambassador. We will continue to champion the role which social enterprise plays in improving society in UK and abroad. 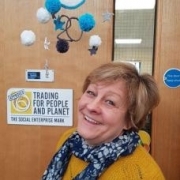 Julie Hawker is Joint CEO of Cosmic, a social enterprise based in Devon, which is very highly regarded for its work in addressing digital skills development and digital inclusion as key priorities across the region. Julie is also a Social Enterprise Mark Ambassador, committed to raising the profile of the Social Enterprise Mark.